The WineKeeper Monterey wine preservation and dispensing system has a professional look that fits in well with a commercial environment, or for the wine connoisseur at home. A pressurized blanket of inert nitrogen protects wine from spoiling and oxidation when being dispensed by the glass from opened bottles. The temperature range in the Monterey for white wine is 42-48° F and 46-68° F for red wine. For optimum performance, a minimum vented air space of 1" each side, 3" behind, and 12" above the unit is required. Mahogany Cabinet. Model features contemporary styling with squared edges, flat surfaces and sliding, thermo-pane glass doors. Two-Stage Regulator, Lights & Thermometer. Thermal-pane glass doors and 8' Remote Nitrogen Tubing with Quick-Connect. 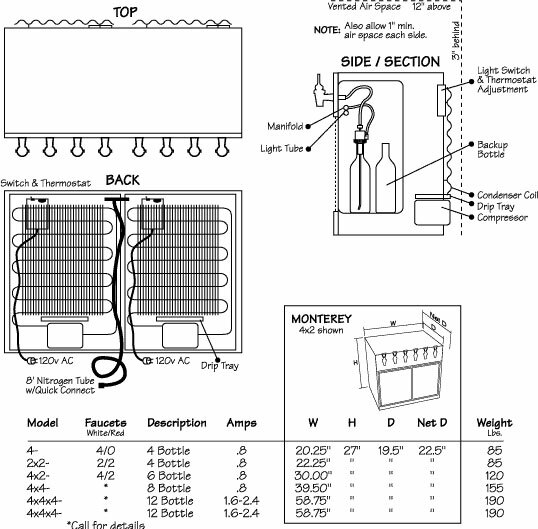 Refrigeration: Auto-defrost, 115 Volt, 60 HZ, 1.1 Amps. Temperature range for white wine is 42 to 48 F, for red wine the range is 50 to 65 F.
Required minimum air space for proper venting is 3" behind and 12" above unit. "Special Laminate" is Anodized Aluminum with a Stainless Steel or Brass look surface which requires no polishing.